Released in late 2016 our very limited Straight Bourbon Whiskey is a very rare find. This Bourbon is the oldest whiskey made and sold in Wisconsin at 7 years of age. The Bourbon was completely produced and aged at our distillery in Milwaukee. 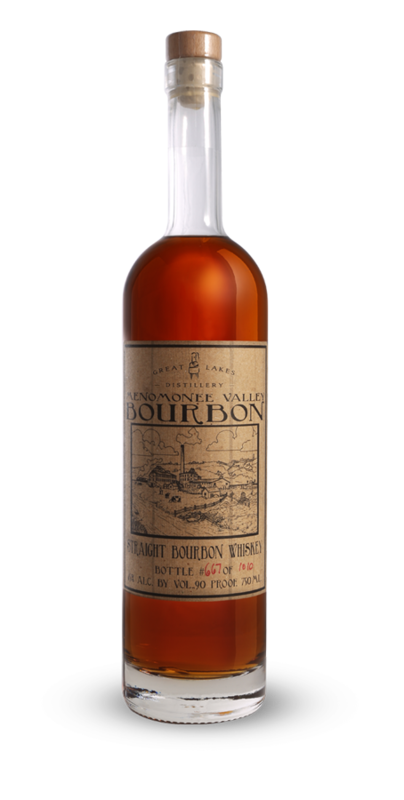 Our Menomonee Valley Bourbon is a straight bourbon whiskey aged 7 years (8 summers) in 53 gallon barrels. It was produced from a mash bill of four grains including 52% corn, 30% rye, 6% wheat and 12% malted barley. It was bottled at 90 proof, only 1010 750ml bottles were produced from the four barrels produced. Get it while you can. Floral nose with hints of green apple. Vanilla, oak and walnut on the palate. Always productive, Milwaukee's Menomonee Valley was once a wetland cut by the Menomonee River where rice grew in abundance. Over the years it became a center of various endeavors including farming, railroading, and distilling. In 1882 there was a distillery on Menomonee Valley's north bluff. Back then it was a lush valley with fresh water ideal for the production of whiskey and the cattle that devoured the distillery's spent mash. Today Milwaukee's Menomonee valley is as productive as ever including, once again, a distillery - Great Lakes Distillery. Menomonee Valley Bourbon recalls a time when whiskey was made in the valley over 100 years ago. We produced this bourbon shortly after we moved and we're happy to share this limited run of history with you.